In upstate New York there is a small farm that appears to be just another farm in the country. Normal. Ordinary. However the Pennywort farm is anything but ordinary and normal….it’s magical. At the heart of the farm there is a magical garden full of imagination and color. The locals have long said that entering the garden can gain insight to life’s most difficult issues by just walking through the gates, ironically the garden’s caretaker has never experienced any kind of revelation by entering the garden. Olivia Pennyworth has been caring for the garden and has spent her entire life on the farm while harboring a dark secret which forces her to keep everyone at arms length…..until her childhood friend, Sam, shows up. Soon Olivia starts to question if the garden is really as liberating as everyone thought or if it’s a prison holding her back. It’s hard to give you a good summary of the story without giving away too many details…..but let’s say it’s kind of like an adult version of The Secret Garden with magical realism and the power of love. I haven’t read a lot of books in the magical realism genre….nor have I read anything by Van Allen, but I enjoy enchanting plots so this book intrigued me when it came up for review. Van Allen’s writing style is lyrical, emotional, and vibrant but yet not flowery or fluffy. I think sometimes writers tend to be flowery in their prose when writing magical books and it can sometimes come off flippant. There is an art the lyrical prose and writing for magical plots and love stories and I think in this case, Van Allen nailed it. She managed to be colorful and and lyrical but not so much so that it muddied the prose if that makes sense. What I liked about this was it lets the reader imagine the setting or story in their own minds using their imagination rather than being overly descriptive and telling the audience what they see. I absolutely loved the magical garden. It sounded like such a wonderful place and I was completely entranced by the idea of it. A+ for the setting! The main characters were interesting. I don’t know that I was completely swept off my feet about the romance between Sam and Olivia but it worked. It seemed more like fairy tale rather than a true romance with substance, which was fine I guess…it filled a need that I was hoping for when I started the book so that’s what counts. I think there was a lot of potential to make their relationship more conflicted and complex but I didn’t feel as though Van Allen fully developed their relationship enough to make it what it could have been. I guess what I am trying to say is I wanted more complexity. There were some things in the book that felt unfinished to me though. The plot wrapped up much to quickly and it wasn’t as complete or polished as I had expected. It was a little slow in spots with a few too many explanations, but on the whole, it was a decent read. Not earth shattering but entertaining and whimsical. This book was a welcome escape and filled a need that I was looking for in my reading. I have been knee deep in mysteries and detective novels of late and I was excited to read something a little more refreshing and carefree….that’s what this book was for me. The cover is inviting, colorful, whimsical, and enchanting just like the book. 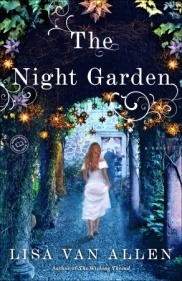 I love the colors and the overall feel of the garden that the artist captured with the cover. It made me want to read the story all the more! For me this was an average read. If you are looking for a book that you can just escape into and not overly think about it, then this is the book for you. Van Allen’s prose is fantastic and alluring.